As a key player in the Australian industry we have earned an impeccable reputation as the world’s foremost supplier of Sliding Panel Saws. But Altendorf Asia Pacific can also supply a range of Edgebanding machines for your panel processing needs. We provide solutions for the woodworking and panel processing industry and for a variety of materials including wood, plastics and alloys. An alliance between Altendorf Asia Pacific and Cehisa means we can now offer the famous Edgebanding machines to our clients in Australia. A world leader in innovative solutions, Altendorf celebrated over 111 years as the best in the industry. In today’s era of rapid technological growth we will continue to lead the way for others to follow. Throughout the century we have learnt the importance of understanding your business in order to provide flexible solutions that work. This is why we take a holistic approach to machinery, training, comprehensive service and spare parts service so that your business will flourish and prosper. The bond between Altendorf and Australia began over 70 years ago when the first of the legendry sliding panel saws were imported to this country. 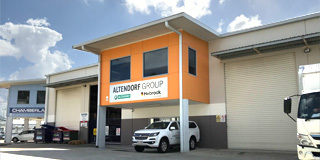 A direct sales and service organisation began in 1989 and since then just about every serious tradesman within the region has enjoyed the pleasure of using an Altendorf. In the field of sliding table saw technology, Altendorf is a shining international example. In 1906 Wilhelm Altendorf invented the sliding table saw. This ground-breaking idea made it possible for the first time to cut an exactly rectangular shape with a saw without resorting to a set square, straightedge, ruler or pencil. As it was developed further, users in more than 120 countries worldwide came to regard the Altendorf name as synonymous with the sliding table saw. No other saw in the history of professional wood processing has ever achieved such high sales. Throughout the world, more than 130,000 Altendorf users have been won over by the outstanding quality of these sliding table saws – a unique success which has made Altendorf the uncontested leader in this market. As a leading player in technology development, repeatedly Altendorf has come up with exemplary new ideas and enhancements, some of which have been every bit as revolutionary as the original sliding table saw. 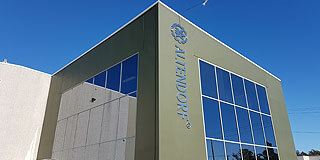 In 2006 Altendorf was 100 years old. What better reason than to research the history of the company and its product – the sliding table saw – in detail. At the end of the project, a whole book’s worth no less was compiled. “The Saw” narrates the story of how the medium-sized company rose to become a world market leader and tells of its struggle for survival between the two world wars, of its conquest of new markets, of its people, friendships, courage and success, and of its passionate beliefs. Go on a journey through 100 years of exciting German industrial and contemporary history, accompanied by many previously unpublished pictures and photos. Experience why over 130,000 users – the majority of them carpenters and joiners – swear by the Altendorf brand and consequently still keep the legend of the Altendorf sliding table saw alive in the industry today. Enjoy the legend of Altendorf in book form: Hardback, numerous illustrations, approx. 300 pages. Order now for AUS $54.99 plus G.S.T (and postage & handling) Contact us on: 1800 558 258 or Email us for more information or to purchase a copy. 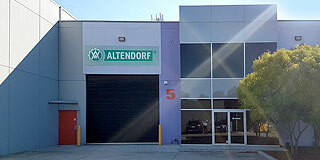 As of March 2018 Altendorf is now distributing direct to South Australia, Western Australia, Tasmania and New Zealand! Contact our toll free number below for exclusive deals direct from Altendorf.